This mango avocado salsa takes about 5 minutes to prepare and it is perfect served with tortilla chips or as a topping for tacos, tostadas, chicken or fish. 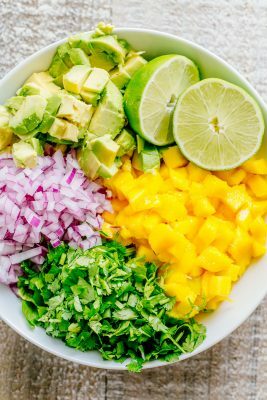 In a medium bowl, combine diced mango, avocado, finely chopped red onion and chopped cilantro. Squeeze 2 Tbsp of fresh lime juice over the top and sprinkle with salt and pepper to taste. Toss gently to combine and serve.